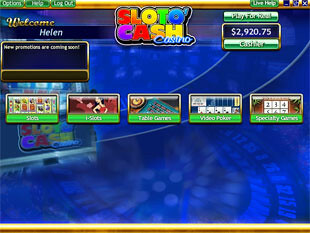 SlotoCash Casino is one of the most trusted names in the online gambling market. The experienced casino team worked had to win its reputation and it works as hard to keep it. A stunning variety o games, especially video poker games, weighty bonuses, welcoming and exciting atmosphere – this is SlotoCash Casino formula of success. This gambling club actively promote gaming responsibility and asks players to know their limits when gambling for real money. 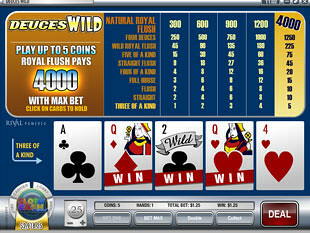 Powered by Rival, this online casino accepts USA players that makes it much more popular all over the world. 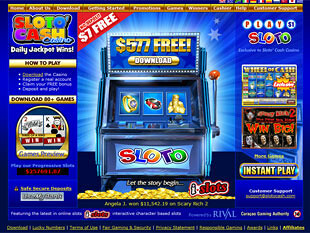 The most impressive casino promotion is $577 SlotsBonus consisting of 4 different bonus offers. First of all, it is $7 Free No Deposit Bonus. Just register Real Money account and visit cashier to claim this bonus. Note that you must meet 40x wagering requirement. Get 100% up to $100 Bonus for your first deposit. Visit cashier and claim this bonus before making a deposit. Minimum deposit – $25, wagering requirement is 15x. Get 50% up to $200 Bonus for your second deposit. Minimum deposit $25, wagering requirement – 15x. Get 25% up to 270 Free for your third deposit. Minimum deposit $25, wagering requirement is15x. 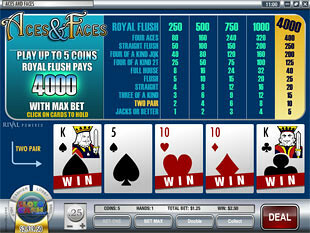 Please note that this bonus can only be used to play 3 Reel Slots, I-slots, Video Slots, Sloto, Keno and Scratch Cards. SlotoCash Casino offers you 50% up to $100 Welcome Bonus to play your other favourite games. Deposit $50 and get $25 Free. Make sure to claim this promotion before making a deposit. Wagering requirement is 33x. You can also take advantage of 15% Alternative Payment Bonus. Just make your deposits via special payment methods offered by casino and get this profitable bonus. Wagering requirement is 4x. To go into details, visit casino cashier. If you want your friends to join the SlotoCash casino, you should jump at the opportunity and claim $25 Refer a Friend Bonus. To refer a friend, visit cashier and click Refer A Friend Tab. Wagering requirement is 15x. The more you play, the more you earn. You can earn special Comp Points for every $1 you wager. The amount of points depends on the game you play and on your VIP level. When you have 1000 points, you can convert them into $1 real money. 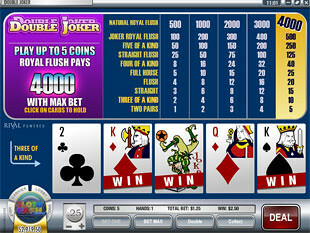 SlotoCash Casino takes great pride in its vast collection of games, including video poker set of games: Aces and Faces, Deuces Wild, Deuces and Joker, Joker Poker, Double Joker, Jacks or Better, Tens or Better. 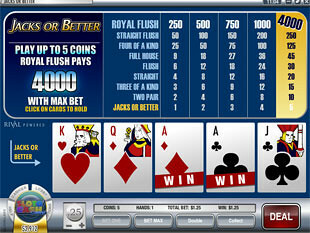 RTG offers you two casino formats – download and flash. Download format contains complete game collection and that’s why it is considered to be better. Flash version is good when you want to play directly in the net. This casino works only with the most reliable and reputable partners to ensure the safety of your deposits and withdrawals: Visa, Moneybookers/Skrill, Eco, Ukash, iDeal, Neteller, UseMyBank etc.